The fourth generation Mustang debuted in 1994, with a major redesign that received its styling cues from the Mustang lll concept car. Engine changes and improvements saw the power from all engine groups improve in a number of ways. The car's V6 engine now produced more horsepower (145 hp) than some of the earlier 1970's cars. The 5.0 Liter V8 Ride actually decreased in power,due to tightening emissions standards, while ride and handling improvements were evident. The new T-bird like cockpit, swept the curvy dash and transmission console rearward. The Mustang Cobra package, added performance to the regular Mustang GT and produced 225 horsepower. Click here for detailed 1994 Mustang specs and information. Click here for detailed 1995 Mustang specs and information. The big change for 1996 was Ford's elimination of the popular 5.0 and introduction of their new modular engine concept 4.6 Liter V8. The new standard v8 put out the same power as the previous motor, but was criticized at the time as taking a step backwards in the performance arena. This was not the case for the new improved Mustang Cobra with its all aluminum 4.6 Liter V8, which put out a whopping 305 hp. The 1998 fourth gen Mustang had minor improvements, primarily focusing on performance, with an increase in power to 225 horsepower. The SVT Cobra offered the Borg Warner T-45 manual transmission, of which, manufacturing rights were bought by Tremec later in the model year. This became a very popular transmission with racers and hot rodders alike. In fact, many builders of early 1960's Mustangs have also converted to this transmission and its simpler and more reliable cable operated clutch. Click here for detailed 1996 Mustang specs and information. Click here for detailed 1997 Mustang specs and information. 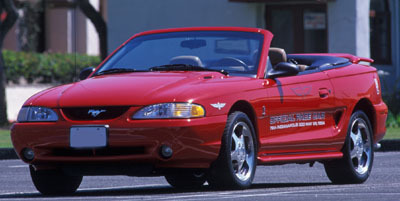 Click here for detailed 1998 Mustang specs and information. Click here for detailed 1999 Mustang specs and information. Click here for detailed 2000 Mustang information. Click here for detailed 2001 Mustang information. Click here for detailed 2002 Mustang information. Click here for detailed 2003 Mustang information. Click here for detailed 2004 Mustang information. Many performance enhancing engine and suspension parts are available for these cars. Click the link for more information on specific model year parts for the fourth generation Mustang .